I try to upgrade from edoras 1.6.13 to edoras 2.0.6. If I start my custom code project with edoras 2.0.6 and an empty MySQL database the following error occurs: “Failed to add the foreign key constraint on table ‘act_procdef_info’. Incorrect options in FOREIGN KEY constraint ‘edorasdev_2_x_empty/ACT_FK_INFO_JSON_BA’ (SQL State: HY000 - Error Code: 1825)”. At the same time I can start my project with an empty h2 database without problem. Could you help me solve this problem, please? The full exception stack trace is attached. Usually flyway errors are due to local database changes that affect the regular database migration path. What do you have as initial database state? I use an empty database for my tests. I create the new schema on mySQL server. Then I start the tomcat with my custom code project. You can see the schema details in the attached screenshot. Hello Olga, can you execute the following statement after the exception appears? you can view the result of the statement in the attached file. I can not check whether it is the case. Could you recreate the ACT_GE_BYTEARRAY table with ENGINE=InnoDB DEFAULT CHARSET=utf8 COLLATE utf8_bin and run upgrade again please? Please let us know whether it helps. I can’t recreate the table manually after running the upgrade, because the table already exists. 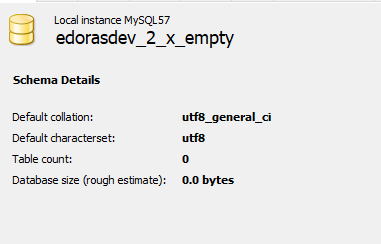 And I can’t create the table manually before running the upgrade, because the flyway error Found non-empty schema 'edorasdev_2_x_empty' without metadata table! occurs. I’ve noticed, that my database has utf8_general_ci collation, but edoras creates the ACT_PROCDEF_INFO table with ut8_bin collation. Maybe this is the problem? After seeing this, I created the empty database with utf8_bin collation und then ran the upgrade again. Unfortunatily an exception occurs on removing external id constraint (java.lang.IllegalStateException: The column WRK_OBJ_EXTERNAL_ID in table EDW_GEAR_WRK_OBJ still has the WRK_OBJ_EXTERNAL_ID index/constraint. Please remove it manually.). The new exception stack is attached. If I try to remove the constraint manually with ALTER TABLE EDW_GEAR_WRK_OBJ DROP FOREIGN KEY WRK_OBJ_EXTERNAL_ID; or with ALTER TABLE EDW_GEAR_WRK_OBJ DROP index WRK_OBJ_EXTERNAL_ID; I get error check that column/key exists. Could you point me to the e.g. MySql docker image (to have exactly the same DB config as you are using) on which I could test this failure please? unfortunatily I can’t give you a mySQL docker image, but I attached the my.ini config file of our MySQL server. Maybe you can reproduce the error with this. We use MySQL Community Server 5.7.23 on Windows Server 2012 R2. could you create an emtpy DB with utf8_bin? and try to run edorasone on this DB. Caused by: java.lang.IllegalStateException: The column WRK_OBJ_EXTERNAL_ID in table EDW_GEAR_WRK_OBJ still has the WRK_OBJ_EXTERNAL_ID index/constraint. Please remove it manually. When I dropped and re-created database with create database edorasone character set utf8 collate utf8_bin;, I applied baseline and granted all privileges to the user, edorasone was started without any error. I have noticed that the error does not occur after reinstalling mySQL. The error is still reproducible on all our old servers. I will compare the preferences of our new and old servers to find out which of them are causing the error. I will inform you when I find the reason.